Life In Argentina: March just flew, and now it's April..
March just flew, and now it's April..
And busy it has been! While we are in a new place, we are working working working, and it is really fulfilling good work. Hard. But good. While I am on a full time contract, Chris' load is full time, with all the classes and workshops and extra curricular, Chris is just as full time as me. Which is really good! We both have things that we are pouring our energy into and focusing on and yes, we have the same hours and holidays which is the coolest! Okay, I have news (and no, ladies don't jump, it is definitely not that news). This year, most of you will know that Gospel Choir is taking a tour to America- NewYork, Boston and Washington. I was always going, but now, Chris is coming too!! and we are both so excited! We both get to go to this new place and share it with 45 kids! wooo! hehe. it is going to so excellent! And that is something very special about St George's! The students go on tours every year... and it isn't like Australia where you go to Canberra to go to parliament house and questacon.. this is go to Europe for 2 weeks on a music tour or Australia on Sports tour or America on a cultural tour. It is amazing! The world seems so much bigger teaching here at St George's and the possibilities of travel and taking students on adventures to actually see Mozart's house instead of a picture in a book is amazing!! And I guess we should be thanking the parents who fund the trip for their children to go on such amazing adventures. That right... the students of St George's are very blessed if you know what I mean. We have booked flights to Iguazu which is where the biggest water falls in the world are!!! it will be a great weekend trip with them! Chris and I have ordered and purchased a sofa bed! It is chocolate brown and will arrive in the next 10 days or so. It was a big adventure looking for the shop that makes them in Quilmes, we also found some amazing amazing 'panderias' which are bakeries.. they were gorgeous! okay, so this couch has a double bed and it will be here for whoever comes to stay!!! we only have a one bedroom place, so our fold out bed will be great! and it is comfy! Chris and I tested it out and paid a bit extra to get the best stuffing for it and everything!! very looking forward to it! We have made friends with some of the expats here. We go cycling twice a week at a small gym about 5 blocks from our apartment with them and it is soooo much fun!! The weekends have just flown by and I can't even remember who we have seen or what we have been doing. But we are surrounded and supported by really lovely people! Okay, so you know I am not a die hard football maniac, but we did go and see a Quilmes vs River plate game last Sunday at our Quilmes staduim.. IT WAS FANTASTIC! 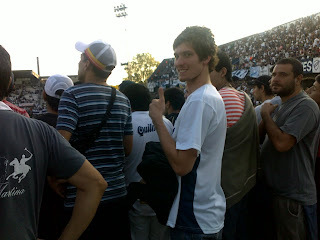 it was about $5 to get into the stadium which was packed!! the crowd was the best thing to watch!! When River scored a goal it was like watching hundreds of people just engulf each other, they literally were diving over the top of one another!! it was such a sight to see!!! We bought ourselves Quilmes shirts to look the part and support our local team and also some 'choripans' which are chorizo sausage in fresh bread with condiments of cooked onion, capsicum and chimichurri which is just off the hook!! sooo so yum! and no sore tum. 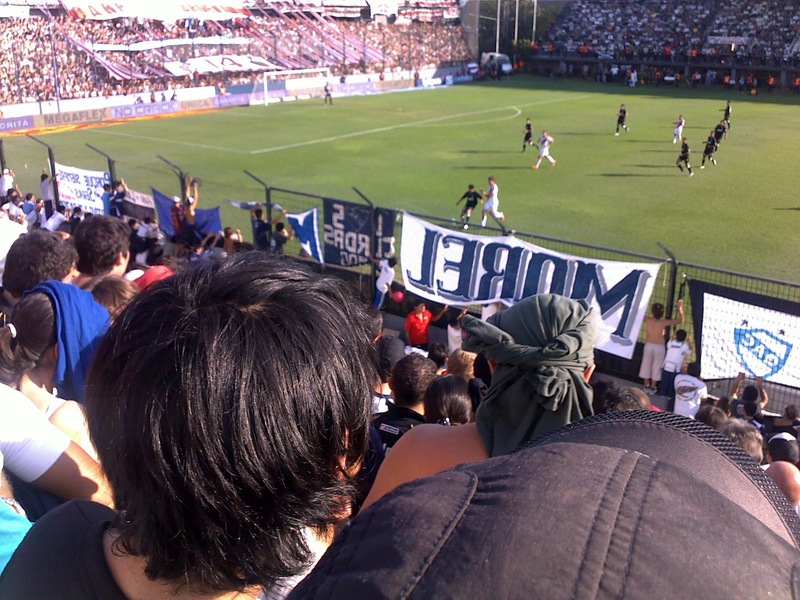 if you come to Argentina, a futbol game is definitely something you must do!! Still loving the helados (ice-cream) or I should say 'gelato' cause that is what it is like... solid, delicious smooth and amazing!! Fresh Fruit and Vege and Meat are so good over here!! Our local grocer is across the road, it is a tiny tiny room filled to the sealing with crates of vegies and fruit! it has that kind of hot grocer smell... but even more intense cause it is such a small room... but everything is fresh and we are served by Fernando, our Bolivian green grocer man. I love him!! I give him a kiss goodbye everytime and try to tip him.. but he always throws in a special piece of fruit.. last time he gave us a massive quarter of a watermelon for free... and he gave Chris and fresh red chilli... which is so hard to come by. It is true, Argentineans don't like spicy food... it is hard to find any sought of chilli flakes..we found some in a health food shop and now we have Fernando sourcing them for us from the markets.. Stirfry with chilli last night for dinner was the best! But on a different note. I want to send my love and prayers and thoughts out to Steve and Claire Earp. We are so far away from you guys and we just send you so much love! I can't even imagine, and just want you both to know that you are in our thoughts. Take care everyone, hopefully I will get my act together and post more regularly! We have taken the most incredible opportunity to move away from sunny Australia and live and work in Argentina. 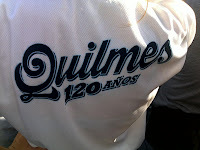 We live in Quilmes, which is 20km south of Buenos Aires. We are both music teachers employed at St Georges College- Quilmes, Miki is in the secondary and Chris in in the Primary. This blog is a personal account of our lives and travels here in South America. Please feel free to contact us with any questions about life in Argentina or anything else.